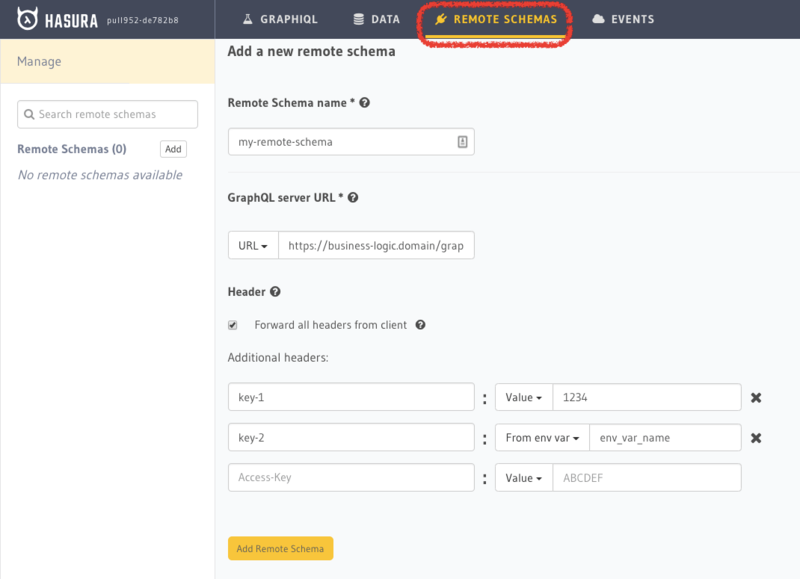 A remote schema is simply an external GraphQL service that you can stitch with Hasura GraphQL Engine for a unified GraphQL API. A common way to incrementally adopt GraphQL in an existing infrastructure, is to wrap pre-existing REST APIs within a GraphQL layer. In this blogpost, we will see how you can do this using Hasura easily. The GET /users endpoint also takes an optional query param i.e. GET /users?name=abc and the POST /users endpoint expects a valid JSON payload in the body. Let's see how we can wrap this in GraphQL. We can already notice some extra information about the APIs and this is one of the selling points of GraphQL: we can see input and output type information very clearly. Lets now move to implementing the APIs. In a REST world, we usually talk about writing handlers for endpoints. In GraphQL, we do a similar thing but call it resolvers! Easy! All we did was proxy the incoming GraphQL request to our REST API. Finally, we need to deploy this service somewhere and get a URL. There are plenty of cloud solutions that allow you to deploy a Node service easily. You can look at the final implementation with deployment instructions on Heroku here. Once you have gotten an HTTP URL for your above GraphQL service, just head over to your Hasura console and add it as a Remote Schema. In case your remote schema defines few types that are same as Hasura, they will get merged automatically too. Notice that you can also add Authorization and other headers to your Remote Schema in case your REST API expects such headers. Now, you should be able to call your remote schema APIs alongwith the default Hasura APIs from the Hasura GraphQL Endpoint. And that's it! 3) you get a unified API layer for all your APIs. With the guide presented above, you can get started with your GraphQL wrapped REST API in minutes. You can then add this GraphQL service as a Remote Schema in Hasura for automatic schema-stitching.